Republished here in full from Francisco Nejdanov Solomin’s “Galtisalie” blog at Daily Kos. When the loved ones who were there for us from day one get old, sick, and in my dad’s case, suddenly stricken by dementia, this film is all I can compare what I feel inside to. I am inside a kid again, when all the freshly mowed grass smells were imprinted, when all the loves and losses were boldest. All I can do is pray that he recovers his mind and wish that I was back then again to do it all over and tell him everything and be there for all of HIS suffering those days and years when all I could think about was my own suffering due to the injustices I felt at the imperfect life Dad and Mom had given my siblings and me. All of that conceptionalizing of imperfection is absurd and itself unjust now. Dad was doing the best he could in an absurd and unjust capitalist world of contradictions and cruelty. It is his flesh and blood, love, companionship, and yes incredibly sweet and active mind that I will never stop craving. The flesh and blood, and love and companionship on some level, hopefully will be around for a while longer, but the mind for now and maybe forever is incapable of sharing with me all of those amazing thoughts, many of which I now disagree with, but yet were and still are on some level so preciously painful or painfully precious. 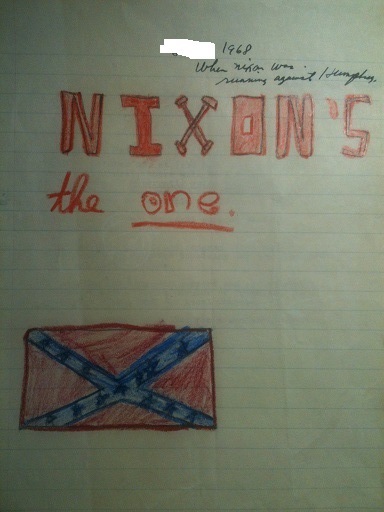 The minor league pro-Nixon, pro-War, anti-Viet Cong “flag”-waving propaganda he encouraged me, not even 11, to be a part of now seems almost quaint–but not quite. Why did the innocent confederate flag-drawing of a boy who did not know better receive no counter-narrative from the most important person in his life–a minister of the Gospel no less? (I know that now Dad considers the consistent failure of the Southern Baptist Church on race to have been the great sin of the years of his active ministry–and we are all in need of forgiveness, which I have assured him he has in God’s eyes.) The tragic deaths in Vietnam of U.S. military representatives, some from our own church, were viewed as “their” fault, not the U.S.’s for being there in the first place; and “their” deaths did not even register. The confusing horror still comes through in its very All-American-Christian-ness. Etc., etc., etc. I just want him to be a part of every stinking moment and every stinking thought. The pride that I feel at looking at the hand-sewn Depression era table-cloth of his mother, mi abuela, made with a bag of Cuban “Hershey” sugar processed by black hands and brown hands like hers, more important than any shroud of Turin, and definitely not fake. It was all real. It is still real in my hands. Etc., etc., etc. I don’t have the energy to cut-and-paste anymore of the photographs of items into this diary. It is the middle of the night for Christ’s sake. Nor do I feel right about putting pictures of them in here, those people I love with all my heart, many long since departed. Suffice it to say that everything that I am, for good and not just for bad, is part of him and his creation, and I want him to always see his creation but it is too late now. When he was still able to comprehend thoughts, I did not have the heart to tell him that, yes, Dad, I truly am a God-damn socialist. I love Marx AND my conception of Jesus, which you created in me by planting the seeds. When you told me at five out in the front Bahiagrass and clay yard, as not only my dad but also the preacher of the Central Baptist Church in Little Yazoo, Mississippi, that I needed to accept Jesus Christ as my personal Lord and Savior or if I died I would go to hell, no matter if I had never done anything worse than steal a piece of candy from my sister’s Easter basket, and I responded “Couldn’t I just be a good person?” and you told me no, it was about some hoop-jumping state of “belief,” I sure enough walked down the aisle the next Sunday morning and professed to accept Jesus Christ as my personal Lord and Savior to get you off my little back, and, just to be on the safe side, get to the good place if I happened to get shot by the rioters if the King march made it all the way up the highway from Jackson in front of our Jim Walter home. But now, even the anti-thesis of everything you ever taught me is your creation, and I thank you. Etc., etc., etc. I will tell you folk out in Daily Kos land who might read this little middle-of-the-night diary that you can read all about my dad in every single word of my left-wing autobiographical coming of political age story, which can be downloaded at the “pamphlets” page of my website, garden variety democratic socialist, in PDF in English and Spanish. The book-length pamphlet is entitled: A Winding Path to Workers’ Gardens: A Half-Hispanic Christian Contemplative Soil Scientist’s Journey to Garden Variety Democratic Socialism Grounded in Our Soil (Un camino de bobina a jardines de trabajadores: de un científico medio-hispano cristiano contemplativo del suelo viaje al socialismo democrático de la variedad de jardín basada en nuestro suelo). But it could just as easily be entitled the story my family and ancestors, including my dad, with all his contradictions and love for me, unwittingly gave to me. Dad will never read it or even know about it. But one day those who come after me may, and they will not only learn about me but the people and the culture who created me, intentionally but also accidentally. The personal dialectical process will continue. I live and breath socialism now, a fact I could not have ever told Dad and certainly cannot tell him now. It would simply be cruel. But, on some level, I will always wish he could know everything. Your son is a socialist Dad, and not just a little, but a down-to-the-bone socialist. A peaceful and loving democratic one, but a socialist all the same. He believes in socialism every bit as strongly as you believed, and maybe in your teary glassy twilight still believe, in the four spiritual laws. The repressive culture that he lives in, which Dad adopted as his own, exemplary, and exceptional, cannot keep him completely silent. Love does not have to be easy to be nonetheless real and indeed bottomless and in some sense eternal. ‘Til the rivers all run dry, as a country song said. ← What in Tarnation is “Prout” and Why Should We Care?